Time is immortal. It never remains the same for any individual. However, a favourable time is ascertained keeping in mind the movements of the stars and planets. An auspicious time selected to perform an important event or action in one’s life is what we know as Muhurtham. If we look at Muhurtham as a whole, it is a unit of measurement of time in Hinduism as per the Hindu calendar. 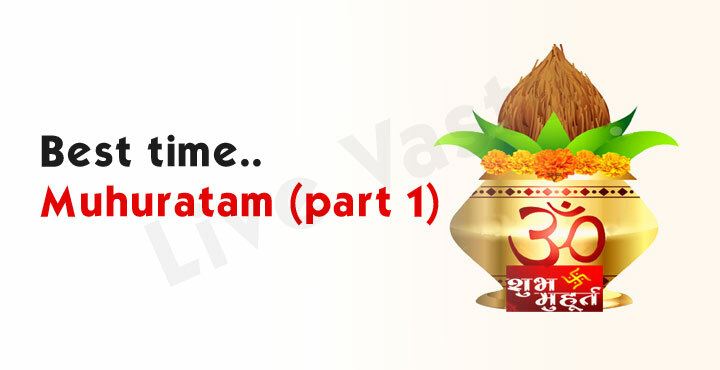 A muhurtham is equivalent to 2 Ghadiyas or over a span of 48 minutes approximately. We all wish to begin and end important moments and decisions of our life during a favourable time frame, be it marriage, celebration of the birth of a child, inauguration of a new property and many such events. If these events are begun during an auspicious time frame (Shubh Muhurtham), it surely would be completed peacefully and even the after affect of it would e favourable, for the people involved, in the long run. Hinduism has a very vast domain and it rests a lot on beliefs and cultures. There are certain times which are considered very lucky and auspicious for a particular activity. One such example is narrated in Ayurveda, ‘Ashtami Vyadhi Nashini’ which refers to the 8th day of a lunar month and the belief goes that medicine taken on this day cures an illness very fast. The logic behind this is that the distance between the earth and the moon is the greatest on this day of the month because of which the liquid medicine remains stable in the stomach thereby bringing about faster and batter results. While choosing the correct and most appropriate Muhurtham for any particular activity, five elements need to be chosen and well synchronised with each other. Planetary positions determine the above factors and the explicitly listed in the Panchanga or Ephemeris. However, while choosing a propitious moment or Muhurtham, make sure the Ascendant and the Moon are strong which in turn is determined by the time selected as per the horoscope of the individual. We have many forces around us which govern our everyday living, one of them being the gravitational force between the planets of the solar system, which affects both living and non-living things on earth. Likewise the high and low tides in the ocean are caused due to the presence of the gravitational force between the moon and the earth. Being a perfect combination of planets in the sky this Muhurtham makes for an excellent choice for human beings to conduct any activity. Likewise, there is a close relationship between astrology and time. The radiation affects of the planetary motions, including the sun and the moon, on all terrestrial phenomenon presents a testimony to the intelligence and accomplishments of a generation. The sun’s rays affects the biological activity while the moon’s rays impacts the psychological actions of an individual. It is believed that seasonal changes and solar radiation even impact agricultural activities like planting, cultivating, growth, maturity and harvest. This time frame is determined as the Sun god spreading his rays of light and energy throughout the globe just like a peacock spreading its feathers. The light rays coming from the galaxies in the form of sun’s rays is believed to influence the human brain, emitting light blue divine positive vibrations which brings the cells and the brain to life. According to Hindu mythology, the Sun God is also the god of life. Hence, the importance of the Brahma Muhurtham lies in the fact that if a man is able to synchronise his senses with these divine rays during this period/hour, he would be empowered with unchallengeable energy. • these rays are light blue in colour which in turn activate the brain cells. • meditation and penance during this time helps in the powerful awakening and spreading of the electrical and magnetic charges. • it calms the brain and helps one to get solutions to all his problems. It has been scientifically proven that at night, the atmosphere gets re-charged while by morning the wind gets charged with the beneficial rays of the moon and the stars. This charged-up wind is known as ‘Veeravayu.’ It is highly beneficial to us as our minds get sharpened and the body gets refilled with new life force.